TSPSC TRT Recruitment Instructions, DO's and Don'ts in English, TSPSC TRT Recruitment Instructions, DO's and Don'ts in Telugu. 2. This hall ticket is valid only if the candidate’s photograph and signature images are legible. To ensure this print the hall ticket on A4 sized paper using a laser printer, preferably a colour photo printer. 12. Candidates will not be permitted to leave the examination hall before the end of the examination. 13. Candidates will be provided a virtual calculator on their computer to do all the calculations for the questions. 20. 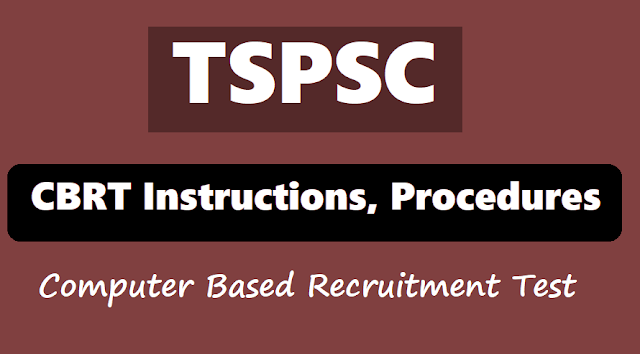 ANY INFRINGEMENT OF THE ABOVE INSTRUCTIONS SHALL ENTAIL DISCIPLINARY ACTION ON THE CANDIDATE WHICH MAY INCLUDE BAN FROM FUTURE TEST of TSPSC AND OTHER PUBLIC SERVICE COMMISSIONS IN THE COUNTRY.